"lap dogs which were brought out of the barbarous borders from the uttermost countryes northward, and they by reason of the length of their heare, make show neither face nor body, and yet these curres forsooth because they are so strange, are greatly set by, esteemed, taken up, and made of, in room of the spaniell gentle, or comforter". So it is sure that the Skye terrier has inherited very few, or even not, characteristics of the Maltese. As an achondroplastic breed, and looking alike the Welsh corgi, it is believed that the Skye Terrier may have been a result of a crossing between the celtic terriers local to the area and the Swedish Vallhund of the Viking invaders. It may be that the Swedish Vallhund had mated with the local terriers centuries before Maltese dogs were said to have arrived, making both histories true. The Skye is double coated, with a short, soft undercoat and a hard, straight topcoat, which must be flat against the body and free of curl. The ideal coat length is 5 1/2 inches (14 cm), with no extra credit for a longer coat. The shorter hair of the head veils the forehead and eyes, forming a moderate beard. The ears should be well feathered and, in prick-eared examples, the hair should fall like a fringe, accenting the form, and blending with the side locks. The colour can be Fawn, blue, dark or light grey, blonde, and black with black points (ears and muzzle) all occur. They may have any self colour, allowing for some shading of same colour on the body and a lighter undercoat, so long as the nose and ears are black. There should be no further patterning on the body, but a small white spot on the chest is permissible. The Skye Terrier coat is resistant to tangling, and needs to be brushed at least once a week. The Skye should be generally kept natural and untrimmed; however, minor trimming of the coat between and around the toes and pads can help avoid problems due to trapped dampness or twigs, pebbles, mud, etc. Except for the shape and size of the ears, there is no significant difference nor preference given between the prick- and drop-eared types. When prick, they are medium sized, carried high on the skull and angled slightly outwards. 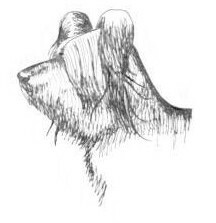 In the drop type, the ears are set lower, are larger, and should hang flat against the head, with little or no muscle movement forwards and backwards. I remember the story of a little dog called Greyfriars Bobby, its a sad but very sweet story. Around 1850 a man called John Gray worked as a night watchman for the police force to keep him company he took along his Skye terrier Bobby and for the next few years they became a familiar sight. John became very ill with tuberculosis and eventually died of the disease in February 1858 and was buried in Greyfriars churchyard,at this time dogs were not aloud to enter churchyards. The very next morning Bobby was found keeping a constant watch and guard over his masters grave, the gardener and keeper of Greyfriars tried on many occasions to keep Bobby out, but the next morning Bobby was there! in the end he gave up and provided a shelter for Bobby by placing sacking beneath two tablestones at the side of John Grays grave. Bobby would leave at 1.00pm each day to go for his food from the local people, he remained loyal to his master for fourteen years untill his own death in 1872. Bobby is also buried at Greyfriars but just outside the graveyard as dogs could not be buried inside the churchyard. Let his loyalty and devotion be a lesson to all us all.